Our Xaman-Ha condominium is located on the Yucatan Peninsula 30 miles south of Cancun. This ground floor unit features two bedrooms with two baths and a double balcony. 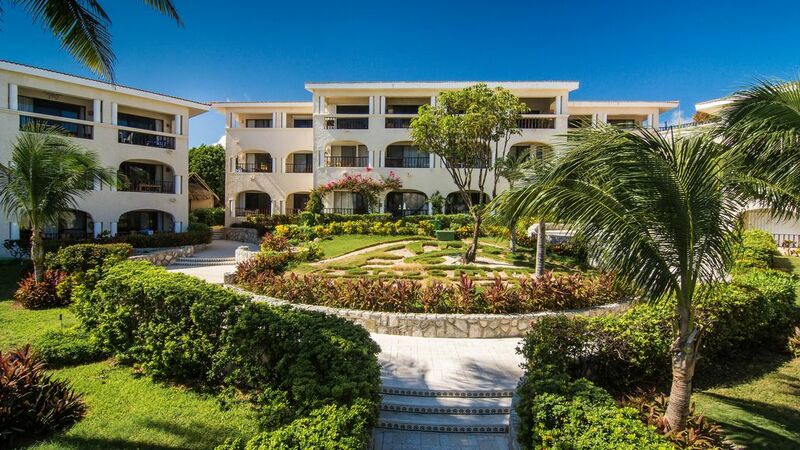 It offers beautiful views and overlooks the pool, beach and Caribbean Sea. Xaman-Ha Condominiums are in the ideal location being right on the beach and just a short walk to 5th Ave with shops and restaurants. This Condo was recently upgraded to include new beds, 400 count sheets, 90 oz. towels, new bath and shower areas, Flat screen TV's and many other improvements that make your stay more confortable. My wife and I are planning to make this our home in the future and we made changes that would make it a place we would want to live. We have been asked many times why we bought our condo at Xaman Ha and our answer is simple; look out the window from the Master bed. You will see the gardens, pool, palapa, beach and the ocean all the way to Cozumel. This coupled with the best beach in Playa, its closeness to 5th Ave. There is no better place to live or visit. We do provide full bottles of shampoo and conditioner in each shower. 60 meters of fine white sand in front of Xaman Ha Condos. This beach is the best beach in all of Playa Del Carmen with its fine white sand from the beach and going over 100 meters into the ocean. Mini-Splits in Master bedroom and Livingroom. Wall unit in 2nd bedroom. Glass topped dining table with 6 custom wood chairs. Our unit has been remodeled with a new kitchen, new appliances, upgraded bath rooms, Mini-split air, and new furnishings, Enjoy all the comforts of home with Cable TV, Stereo with CD player, washer/dryer, ceiling fans in all rooms, beach toys, private pool and beach access. Wonderful place to stay in Playa del Carmen! The beach, the pool, our room were all with in a few minutes walk-- perfect for a family traveling with kids! Swim up bar with drinks and food was super fun and our kitchen was perfect when we wanted to eat in. We loved walking around playa each afternoon exploring and finding great restaurants off the beaten path. Kids loved it, we loved it! We rented the condo from Rodger for my 50th birthday and travel with my bonus sister and bonus brother for a week of celebrating. Before the trip I emailed Rodger questions about ground transportation and his recommendation provided on time,clean van's with icey cold AC(its warm & humid until you aclamate so its neccessary) . We arrived at the condo, our first impression driving into the gated, 24-hour guard service was tropical jungle. The property is well kept, clean and grounds were being groomed all day everyday. Upon getting to the condo it was clean, furnished nicely with a kitchen full of cookware,ect. There was even beer(nonalcoholic) and a white wine in the fridge. The beds are comfy, there is a generous king in the master that has a grand view and roaring sound of the ocean to lull you to sleep after a day of exploring ,it looks out to the pool with a swim up bar. The 2nd bedroom had a queen and bunk beds and is family friendly. There are towels galore, and thick huge pool towels. The bathroom showers are large and have great water pressure. There is a wash machine and dryer. Everything is walking distance and if you don't want to walk taxis are every where. Just note go out onto the main street or you'll pay 150 pesos insidenthe condo area where on the street it is about 75 pesos, it's still not expensive but we walked every where, even to Walmart for groceries(the condo has bottled water service but we enjoyed chilled water so we bought bottles to tote along while out exploring). There is board games for the kiddos if your traveling with,a pool that is family and adult friendly and beautiful song birds in the am with cute geckos, giant iguanas and agouti, which will Cruz by on the grass and if you so happen to have tortillas or fruit greens they love it. They are quiet,polite and fun to watch. There is also a mall with Old Navy,Starbucks some restaurants and shopping close by. Excellent family place to stay!!! The place is so nice and lovely!! Mr Roger was so kind with us. We really enjoyed spending time with our family and this place has everything you need to have a lot of fun!!! For sure, we will plan to come back.again!! Thanks a lot Mr Roger for sharing your place with us. Location was Ideal- Simply the best! The condos at Xaman- Ha are on the most beautiful stretch of beachfront in Playa. They are located so close to town so they are really convenient to anything. The grounds and pool area (which is fantastic) are very clean and very well maintained. We would not hesitate to stay here again. I would have rated 5 stars but I felt our unit needed a little TLC. Want to say again that it would Not keep me from staying here tho- Roger the owner was very hospitable and was hands on if we encountered any issues which we had None! Maid service was very good. We even had a friendly kitty cat named Gordita who we befriended on our stay. All in all a wonderful vacation! I cannot wait to visit again! Thank- you Roger! Our family of 4 (college daughter and 15 year old son) stayed here for a week in early March 2017. The location was absolutely perfect. If you are looking for someplace that is located within walking distance of all the 5th action but also want a quiet place to relax this is it. The beach front is the best of any location. There were plenty of resort beach chairs on the sand and at the pool. The condo includes some water toys and you can check out additional items from the lobby. Mayan ruins are located just across the street from Xaman Ha as well as three other locations within walking distance. Other Activities: include both high end shopping as well as shopping for local handicrafts Over seven hundred restaurants that will assure that you will be able to find a mean of your dreams.